Want Hair Colour That’s Subtle and Easy to Maintain? Most people probably don’t think the terms “hair color” and “low maintenance” go together. Instead, many think coloring your hair means frequent trips to the salon every six to eight weeks and a lot of money shelled out for upkeep. But coloring your hair doesn’t have to be such a hassle. If you want to change up your hair color, but want a look that’s subtle and easy to maintain, try an ombrė-inspired look with panels of color that compliment your natural hair color. Not only is it beautiful, but it grows out well too, which means less frequent trips to the salon for you. Don’t be afraid to tell your stylist what you want. Start off by informing them that you want a look that won’t require a lot of follow-up visits. Asking for highlights that are no more than two shades lighter than your natural hair colour will allow them to blend in more easily and to grow out less noticeably. Ask for panels of colour. Traditional highlights or Ombrė’s can have distinct contrasts from light to dark or vice versa. 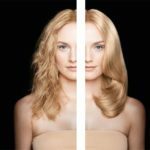 By asking for panels of highlights on the layer of hair just beneath the outermost layer, they will blend in more easily with your natural hair color – which is still visible – and will look good as they grow out. be afraid to mix them up a little. Layers are a great way to show off your new highlights so why not get a trim while you’re at it? Then be sure to take care of your new look with a color care shampoo and conditioner to prevent further fading. Some natural fading will occur from both sun exposure and the act of shampooing – which can open the hair’s cuticle and change the hair’s colour – another great reason to opt for subtle colour!